"There are so many different reasons that people go to the theater," muses Amy Pinto, artistic director of Santa Rosa's Imaginists Theatre Collective. "For some, it's simply a desire for entertainment, but for a lot of others, it's something more. It's deeper. It's a desire for theater that is entertaining, yes, but also for theater that focuses on the pushing of boundaries, the asking of questions, delving into the mysterious. That's the kind of theater we feel driven to do. And we are gradually finding audiences who want that experience as well." "Why do people go to the theater? What do they want from that experience? As artists, that's a vital question to keep asking ourselves," adds executive director Brent Lindsay. "That question—the willingness to ask that question—is, I think, a big part of what defines ITC, both our artists and our audience." How does an experimental company rooted in creating impossible-to-describe theater reach out and attract new people, and then keep them coming back? Inexplicably, that's what the scrappy Imagininsts have been slowly but steadily doing. "For us, it's not a question of marketing," Pinto says. "It's not 'How do we fill x number of seats on x number of nights?' For us the question is, 'How do we build a community of theater makers and theater watchers? How do we let people know that our doors are open, and that that community exists right here in this big old Quonset hut in Santa Rosa?'" It is inside that big old Quonset hut, a former Santa Rosa automotive shop, that the Imaginists have been creating their own brand of description-defying work for the last year, stewing up a rich blend of classical works and exciting, experimental, actor-developed pieces. The genesis of the company goes back to the North Carolina School of the Arts, where Lindsay and Pinto formed an experimental company called the Knights of Indulgence. That company moved eventually to Delaware, and (inexplicably) to Truckee, near Lake Tahoe, where the company disbanded in 2001. 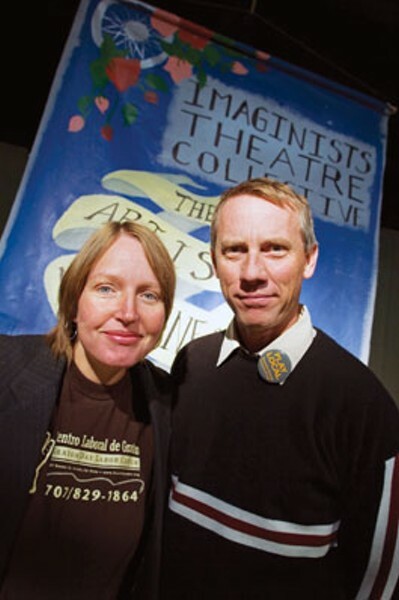 Shortly thereafter, Pinto and Lindsay found themselves in Healdsburg, where for the last several years they worked to establish the Imaginists, initially focusing solely on developing a school, handing down their unique brand of artist-driven theater-making to eager young students. "Every individual in that room, every kid, is an artistic voice that has to be heard," explains Lindsay. "It is the students who create the shows. We merely facilitate it." Those classes, which continue now at the Santa Rosa location around the corner from Juilliard Park, have been made intentionally affordable, with sliding-scale tuitions and a commitment that all be welcomed. "We made a pact when we first started," Lindsay continues, "that we would never turn anyone away. What this ends up bringing is incredible diversity, kids from all kinds of backgrounds creating together." Since moving to the permanent Quonset space, Lindsay and Pinto have returned to the kind of theater they started out doing, launching a series of hard-to-define experiences that combine a whole range of theatrical influences. Among these is the memorable Ubu Rex, a scatology-packed madhouse adaptation of Alfred Jarry's scandalous 1896 satire. That show was a landmark for the Imaginists, drawing sellout crowds of first-timers, as did the recent Extranjeros En Su Propia, a powerful bilingual collaboration with the Graton Day Labor Center. According to Pinto, the Imaginists' largest segment of growth has been among young people and people who have never or seldom gone to the theater before. "We've definitely seen a younger crowd than [do] a lot of theaters, and that's encouraging for the future of theater in the area," she says. "We draw young people, old people, families, English-speaking, Spanish-speaking. A lot of folks from the junior college have been checking us out. And it's all been through word of mouth. "We don't do advertising, so people hear about us primarily from other people who've discovered us and decided that what's happening here is worth talking about." Imaginists Theatre Collective, 461 Sebastopol Ave., Santa Rosa. 707.528.7554.